People often ask me where I buy items I'm wearing, but often I get blank stares when I tell them! I love shopping and I'm pretty familiar with all the options online, so it always startles me to discover that the majority of women limit themselves to going to major chains' online sites. Sure, UrbanOutfitters.com and Macys.com are great, but one of the best parts of online shopping is finding the unique pieces you won't see on anyone else! So here are some of of my favorite stores to shop, I highly recommend you check them out! Starting off as a UK website, it's now a global destination for hundreds of thousands of savvy shoppers! I love it's mostly budget conscience chic items under $100, yet you can also find brands like Karen Millen, See by Chloe, Manoush, Paul Smith - offbeat but certainly high quality European designers! They have petite and curve sections that are possibly the best I've ever seen, I am addicted to their petite denim personally! There are some great maternity items, I know where I plan to shop once I get pregnant! And now I need to stop talking about ASOS before I start shopping uncontrollably! It really surprises me when I find out some people don't know about Bluefly! One of the first online stores I shopped, they stock fabulous designer pieces all on discount, often 30 - 40% off! People always wonder how I can afford so many fabulous items in my closet... well if you've been shopping this site since 2002 and spent more than $4,500, you'd have amassed a rocking wardrobe too! ModCloth has become a fashion blogger favorite for its girly quirky style and affordable prices! Their picks always seem simultaneously vintage and fresh, and almost every time I wear something from the site I get compliments! Net-A-Porter is, without a doubt, the online destination for high end designer clothing! Unless you live in NYC, you'd have trouble finding brands such as Lanvin, Herve Leger, and Jimmy Choo. 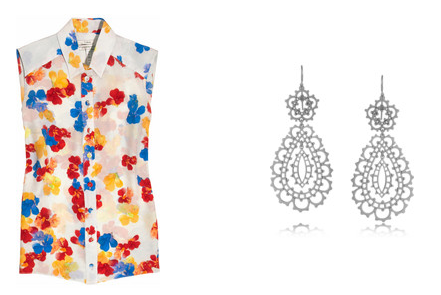 But now, with the magic of the interwebs, you too can dress like you're Carrie Bradshaw! And if prices are too high for you, check out the sister site, theOutnet.com, which has all their clearance items! I first came to Nasty Gal due to their choice vintage pieces! It's like someone went through a thrift store and found all the best items for you, what a time saver. But their new items are equally as fabulous - lots of edgy, urban items for the fashionista! Do you have a favorite store you'd like to share? I love all the places you listed with net-a-porter being my fave! This earrings looks great, i like it so much,where can i get it?